Too often we find ourselves racing toward some elusive, preconceived end-all or be-all finish line. We believe that if we reach this place that we’ll be happy. Yet what happens when we reach it is that we envision a further step that surely will do the trick. It seems there will always be another “there” we’d rather be. So, I stepped back from my routine last month to make the most of now with my family. We took a wonderful camping trip to Ricketts Glen State Park where cell service is nonexistent so that unplugging from emails was a fait accompli. Instead, we hiked along the trail from one beautifully cascading waterfall to the other and simply drank in nature’s beauty and peace. We also visited Hawk Mountain, site of a biannual raptor migration. The whole experience recharged my soul. As we all embark on this winter’s holy season of light, starting with an entire day set aside for Thanksgiving, let us vow to regularly unplug and spend quality time now nurturing ourselves and enjoying loved ones. I’m often asked if I will be attending this or that workshop or seminar listed in our monthly calendar; honestly, I’d like to attend more, even all, of them. 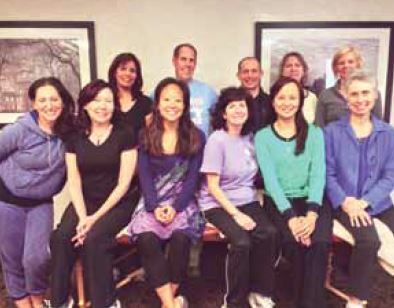 Recently, I was blessed to be able to attend half of a two-day workshop presented by Arlene Green of the U.S. Kinesiology Institute, of Chapel Hill, North Carolina, when she visited our area (pictured here, front row far right). Ever since becoming a Natural Awakenings publisher, I have wanted to explore bodywork therapies as a giver, not just a receiver, so that I could help family and friends in this way. When the unusual free-day offer came to light, I became an enthusiastic participant in Green’s class on pain release. Since then, I have used many of the tools presented and feel empowered to be able to help others in this way. I encourage you to explore this month’s offerings to see what speaks to you and to find one fresh bit of knowledge or develop a new skill that you can use to help another. Offerings include recipes, tips and events. I’m already looking forward to the next time I find myself in class and hope to see you there. This entry was posted in DEPARTMENTS, Letter from Publisher and tagged audrey chen, letter from publisher, lfp, november 2014 by Healthy Living Bucks and Montgomery Counties. Bookmark the permalink.